One of the early roads in Berrien County described by William Green Avera was, “the road from Milltown northward to Tyson Ferry on the Alapaha River just east of the present site of Alapaha. This road pass[ed] by the residence of the late John Studstill, first sheriff of Berrien County, later the home of Joe Studstill, his son; Stony Hill, the old residence of the late Moses C. Lee; Keefe and Bullocks Turpentine still; the residence of the late J. H. Rowan [and] the residence of his widow, Mrs. Phoebe Rowan; the residence of the late William Gaskins — the grandfather of the late Alvah W. Gaskins of Nashville, GA.” At Tyson Ferry, the Milltown road intersected the Coffee Road. It was the 1823 opening of the Coffee Road that led to the creation of Lowndes County, which then covered a vast area of Wiregrass Georgia including present day Berrien County, GA. When John Coffee first cut through the wilderness, there was no ferry or bridges. Early travelers on Coffee road traversed the Alapaha river at Cunningham’s Ford. With seasonally high water, the river was no doubt difficult, if not impossible to cross. The WWALS Watershed Coalition documents a number of waypoints, creek and river crossings on the route of the old Coffee Road. It appears that some time prior to 1836, a ferry was established over the Alapaha for the convenience of Coffee Road travelers. Marsh’s Ferry was operated by Reuben Marsh, an early settler of Irwin County who was one of the commissioners appointed by the legislature to fix the location of the county seat, Irwinville. In 1836 the Georgia Assembly provided partial funding for the construction of a public bridge over the Alapaha River. Later records of the Inferior Court of Irwin County indicate Tyson Ferry was put into service to replace this bridge . AN ACT, To appropriate the sum of eight hundred dollars, to build a Bridge across the Lopahaw. Sec. 1. Be it enacted by the Senate and House of Representatives of the State of Georgia in General Assembly met, and it is enacted by the authority of the same, That Jacob Polk of the county of Irwin, Daniel Grantham, Sen’r. John McMillon, be and they are hereby authorized to draw and appropriate the sum of eight hundred dollars, for the purpose of building a Bridge over and across the Lopahaw, at or near where the Coffee Road crosses the said river, and for the repair of Coffee’s Road. Sec. 2. Be it enacted by the authority of the same, That the said Commissioners shall give bond and sufficient security for the faithful discharge of their duty, and properly to expend the aforesaid sum for the erection of said Bridge. Sec. 3. And be it further enacted by the authority aforesaid, That His Excellency the Governor, be, and he is hereby authorized and required, on the receipt of said bond as before required, to pay the amount of eight hundred dollars to the said Commissioners aforesaid, out of any money in the treasury not otherwise appropriated. Assented to, Dec. 26, 1836. It appears that the Lopahaw bridge was not constructed on the direct path of Coffee Road over the Alapaha, for at the February 1838 term of the Inferior Court of Irwin County marking commissioners were appointed to lay out a route which bypassed the ford and proceeded over the public bridge, rejoining Coffee road after the crossing. at or near Micajah Paulk’s, Sr. When the Inferior Court of Irwin County next met road commissioners were appointed for Coffee Road, to include the new routing over the public bridge. At July term, 1838, Leonard G. Jackson, Shaderick Griffin and Andrew McClelland, appointed commissioners on road, commencing at C. Tyson’s to public bridge on Alapaha, then to intersect Coffee road near Micajah Paulk’s, they to commence at county line and ending at district line. In the early part of March, 1841, after President Harrison’s inauguration, the big fresh occurred west of the Oconee, and the Ocmulgee, Flint and Chattahoochee rivers, and all other smaller streams, contained more water and produced greater damage than ever known. In this section the last inundation was also called the Harrison freshet; hence the confusion that arose many years afterwards in distinguishing which was the proper Harrison fresh. The discrimination was, however, distinctly recorded at the time of the occurrences. The fresh of May and June, 1840, while the convention was held at Milledgeville, was named by the Democrats, “The Nomination Freshet,” and the fresh of March, 1841, was also named by the same “unterrified” authority “The Harrison Inauguration Freshet.” An iron spike was driven into the western abutment of the [Macon] city bridge by Mr. Albert G. Butts, denoting the highest water ever in the river down to that time, March, 1841. The spike still remains, and is inspected at every freshet in the Ocmulgee. Whether or not the Lopahaw Bridge weathered the storm is not known, but Clement’s History of Irwin County relates that “the public bridge” over the Alapaha was condemned at the January 1856 term of the Irwin County Inferior Court. Cornelius Tyson was one of the five marking commissioners appointed by the state legislature in 1856 to fix the boundary lines of the newly created Berrien County. Cornelius Tyson is enumerated in Berrien County, GA as Cornelius Tison in the Census 1860. After south Georgia was first opened to settlers in the 1820s, the federal government established post offices to serve the pioneers. But for many years, the Post Offices of the Old Berrien Pioneers were few and far between. As of 1836 there were only two post offices in all of Lowndes County, GA, an area which then encompassed present day Lowndes, Berrien, Cook, Brooks, Lanier, and parts of Tift, Colquitt, and Echols counties. These post offices are shown on the 1839 Map of Georgia & Alabama exhibiting the post offices, post roads, canals, rail roads & c.; by David H. Burr (Late topographer to the Post Office), Geographer to the House of Representatives of the U.S. In 1836 area settlers traveled to post mail either at the county court house at Franklinville, GA, or at a post office on the Coffee Road which existed only briefly in Lowndes County. Contemporary accounts give the name of this post office as Mangum, although the 1839 Burr postal map, the official U. S. Postal Service Record of Appointment of Postmasters, and List of the Post-Offices in the United States give the name as Magnum. 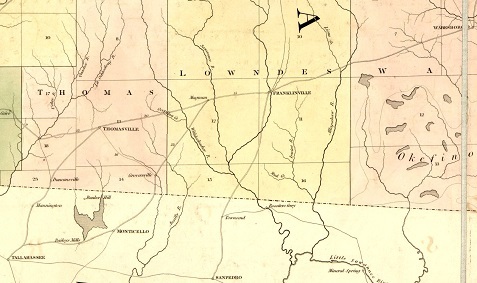 1839 map of Lowndes County, GA showing post offices and stagecoach routes. (Detail of 1839 Map of Georgia & Alabama exhibiting the post offices, post roads, canals, rail roads & c.; by David H. Burr (Late topographer to the Post Office), Geographer to the House of Representatives of the U.S.). Actually, the Burr map was out of date by the time it was published in London in 1839. In 1836, the Franklinville post office was located near the Withlacoochee River about 10 miles southwest of the homestead of Levi J. Knight at Beaverdam Creek (now the site of Ray City, GA). But in 1837 this post office was transferred another 12 miles farther southeast to Troupville, GA when the county seat was relocated to the confluence of the Withlacoochee and Little rivers. The Magnum post office, as shown on the 1839 Burr map, was situated another 15 miles to the west of Franklinville, GA. Prior t0 1836 it was been known as the Sharpe’s Store post office, where Hamilton Sharpe served as postmaster and operated his country store on the Coffee Road. Sharpe, who had become busily engaged with politics and with the Indian Wars, stepped down as post master in 1836. The Sharpe’s Store post office was renamed Magnum post office, and John Hall, Sr. took over as postmaster effective April 1, 1836. Milledgeville Federal Union, Apr. 28, 1836. THE POST-OFFICE, at “Sharpe’s Store” Lowndes county, Georgia, has changed its name to that of Mangum and John Hall Esq. has been appointed postmaster. Postmaster John Hall, Sr. was a brother of Sion Hall. Sion Hall, one of the very earliest settlers of Lowndes (now Brooks) county, had established a tavern on the Coffee Road about 1823. Sharpe’s Store had opened about four years later near Hall’s Inn, which served as the first site of Superior Court meetings in Lowndes County. The Magnum, or Mangum, Post Office was short-lived, though. 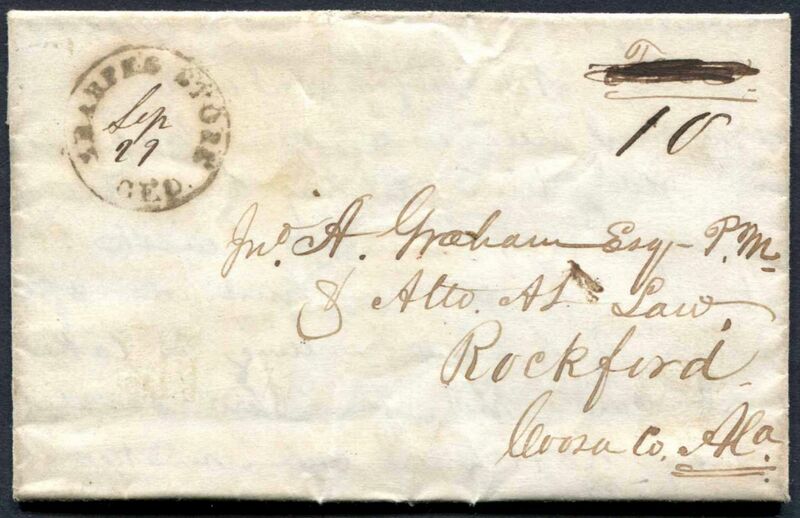 Postal records show that on January 28, 1837 the name reverted to Sharpe’s Store Post Office, and Hamilton Sharpe resumed as post master. Sharpe served as postmaster until 1848, and the Sharpe’s Store Post Office continued under other postmasters until closing in 1853. 1836-37 Postmasters at Magnum and Sharpe’s Store Post Offices, from official Records of Appointment of U. S. Postmasters. After the post office moved from Franklinville to Troupville in 1837, the Knight’s and other early settlers of the Ray City area had a round trip of about 44 miles to get their mail. The round trip to the post office at Sharpe’s Store was about 50 miles, although it was may have been on the better travel route via the Coffee Road. But for the Knights, the bustling town of Troupville, with its social happenings, travelers and ramblers, commerce and trade, religion and politics, court proceedings, legal affairs, amusements, hotels and inns, was undoubtedly the preferred destination. On the other hand, Hamilton W. Sharpe, like Levi J. Knight, was a political and military leader of Lowndes County, and the two are known to have had frequent associations. When south Georgia was first organized into counties in 1818, the area of present day Berrien County was originally part of old Irwin. The land lots and districts in Berrien County are still derived from the original plat of Irwin County. As related in a previous post (see Coffee’s Road Passed Seven Miles West of Ray City, the earliest roads in Berrien County date from shortly after the formation of Irwin. In writing on the local histories of Wiregrass Georgia counties, Folks Huxford made a number of references to the Coffee Road, portions of which are excerpted below. The first two roads to be opened up in the new County of Irwin were the Roundtree Trail and the Coffee Road. The former extended from Pulaski County across the headwaters of the Alapaha River and entered present Tift County near Tifton, and then down the Little River. However, the Coffee Road became the great thoroughfare of travel. It was the main thoroughfare from the older settled portion of the state into South Georgia and Florida; and practically all traffic from and into Florida west of the Okefenokee Swamp, was over that road. It led from Jacksonville on the Ogeechee River in Telfair County, southwesterly through the then county of Irwin (but now Coffee, Irwin, Berrien) through the then county of Lowndes (but now Berrien, Cook and Brooks) into Thomas County and via Thomasville southwardly to the Florida line. Coffee Road was opened up by the State under authority of an Act of the Legislature approved December 23, 1822. John Coffee and Thomas Swain were appointed to superintend the construction, which was undertaken at a cost of $1500.00 (see Coffee’s Road Passed Seven Miles West of Ray City. Enoch Hall, a Lowndes county pioneer and son of Sion Hall and Mrs. Bridget “Beady” Hall, was an overseer in the laying out of the Coffee Road. The road was duly opened and became known as the ‘Coffee Road’ from the fact that Gen. John Coffee of Telfair County, one of the Commissioners, had charge of its opening. It ran through the present counties of Berrien and Cook into Brooks and thence into present Thomas. It afforded the main highway of travel for some years down into Lowndes and Thomas and Decatur Counties and into West Florida. Just two years after the cutting of Coffee’s Road, Lowndes County was cut from Irwin. The area of Lowndes county was still a huge country which then included present day Berrien County and many surrounding counties. 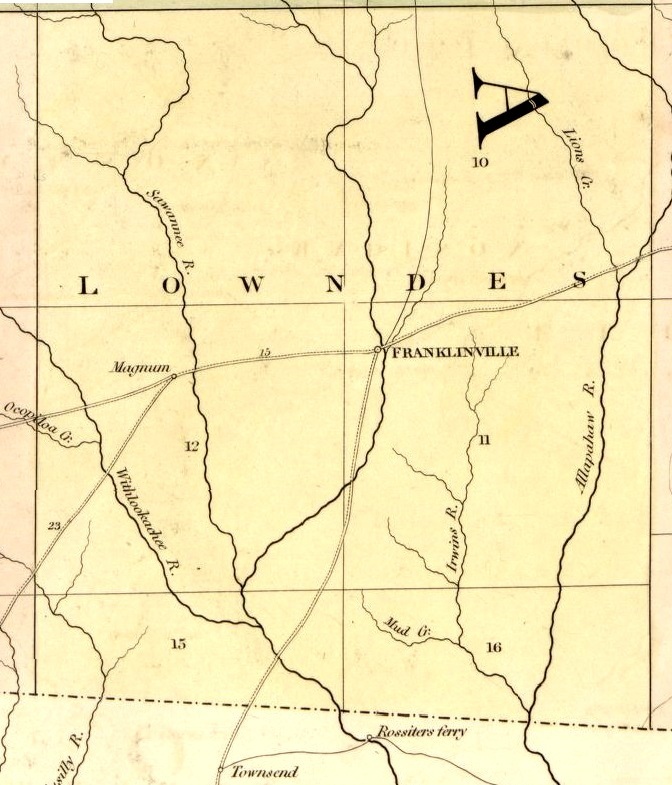 In those early days of Old Lowndes County, most of the settlement had occurred along the route of Coffee’s Road, or else along the Alapaha and Little rivers. 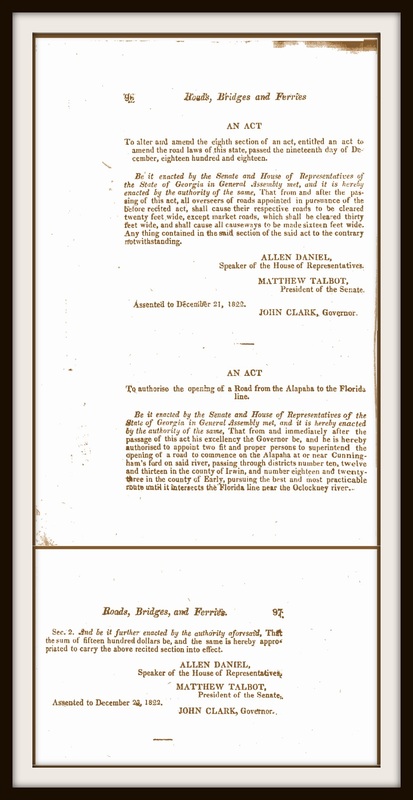 The General Assembly acted in 1836 to fund the construction of a bridge across the Alapaha River stating”it is all important that a bridge should be built across the Lopahaw, at or near Coffee’s Road.” According to the Legislative Act authorizing the Coffee Road, it crossed the Alapaha “at or near Cunningham’s ford on said river.” In 1836 a public bridge was constructed over the river, but this bridge was condemned at the January 1856 term of the Irwin County Inferior Court. At the 1856 term of the Irwin County Inferior Court, according to James Bagley Clements’ History of Irwin County, “Cornelious Tyson was granted authority to erect a ferry on Alapaha River on the Coffee road at the location of the condemned bridge and he is allowed to charge the following rates: man and horse, six and one-fourth cents; horse and cart, twenty-five cents; four-horse wagon, fifty cents; horse and buggy, thirty-seven and one-half cents.” Cornelius Tyson was one of the five marking commissioners appointed by the state legislature in 1856 to fix the boundary lines of the newly created Berrien County. Cornelius Tyson is enumerated in Berrien County, GA as Cornelius Tison in the Census 1860. Futch’s Ferry was at the Withlacoochee River on the Coffee Road. Among the earliest waypoints on the Coffee Road were the homes of David Mathis, Sion Hall, Daniel McCranie, Hamilton Sharpe, and James Lovett. In January 1826, David Mathis built a log home, a sturdy and comfortable home for his wife, Sarah Monk, and family. This home was on the Coffee Road, one mile east of the present village of Cecil, Cook County. It was a stagecoach stop where the horses were rested. Many people in those pioneer days enjoyed the hospitality of the Mathis home. Another waypoint on the Coffee Road, to the north of Hall’s Inn, was the Folsom Bridge, where Coffee’s Road crossed the Little River. William Folsom’s place was located about a mile and a half east of the bridge. 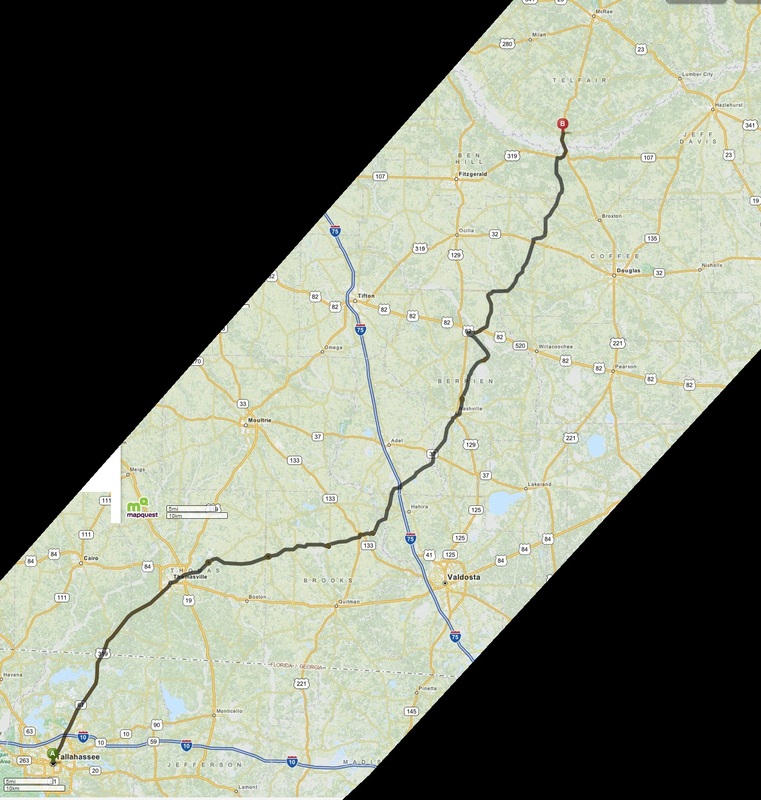 “The next point of interest on the Coffee Road after leaving McCranie’s post office was ‘Sharpe’s Store’ which was in present Brooks County and situated some fifteen miles westward from old Franklinville [ approximately 25 miles southwest of the point where the Knights settled at the present day site of Ray City, GA]. Hamilton W. Sharpe, then a young man hardly in his twenties, had come down from Tatnall County over the Coffee Road, and decided to locate near the home of Hon. Sion Hall at whose home the first court in Lowndes was held a few months afterwards. So young Sharpe built a small store building out of logs near the Sharpe home; that was in 1826. He along with others expected that the permanent county-seat would be established there. 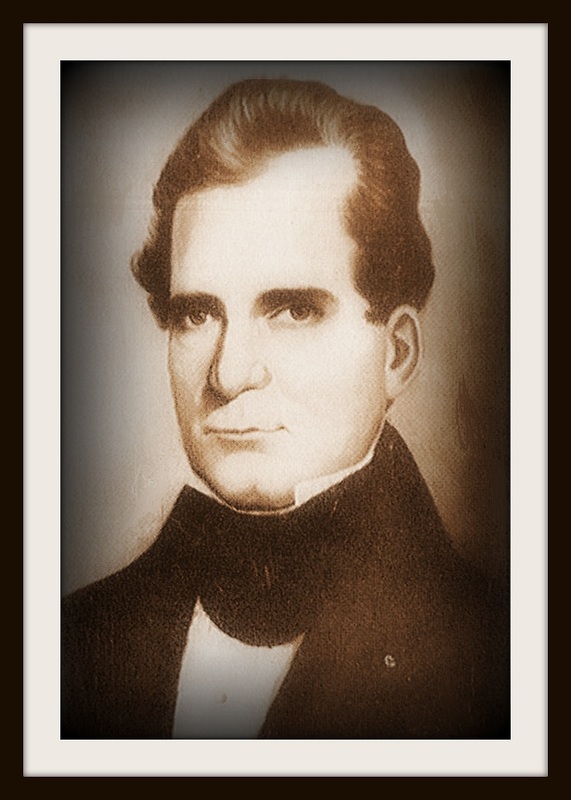 William Hendry brought his family from Liberty County, GA to Lowndes County (now Brooks) about 1827, and settled in the vicinity where Coffee Road crosses Mule Creek, about midway between Pavo and Quitman, GA. William Hendry was one of the prominent citizens of Lowndes County in his day…his upright and godly life and character has been handed down, by word of mouth, to the present generation. The Hendrys seem to have had skill building and operating mills in Liberty County and again on Mule Creek in his new home. He erected the first water driven mill in this part of Georgia. The streams were either “forded” or crossed by means of ferries owned by private individuals. Fares for ferries were fixed in each county in those days by the Inferior Court. In times of high water the streams which were “forded” would often “swim” the horse and vehicle for two or three days and at times even longer, and only those on horse-back could have any reasonable hope of making a trip without interruptions. There were no bridges on any of the streams until after the Civil War. Using a historic standard of living for comparison, the $25 fare would have equated to about $612 in 2010 dollars. 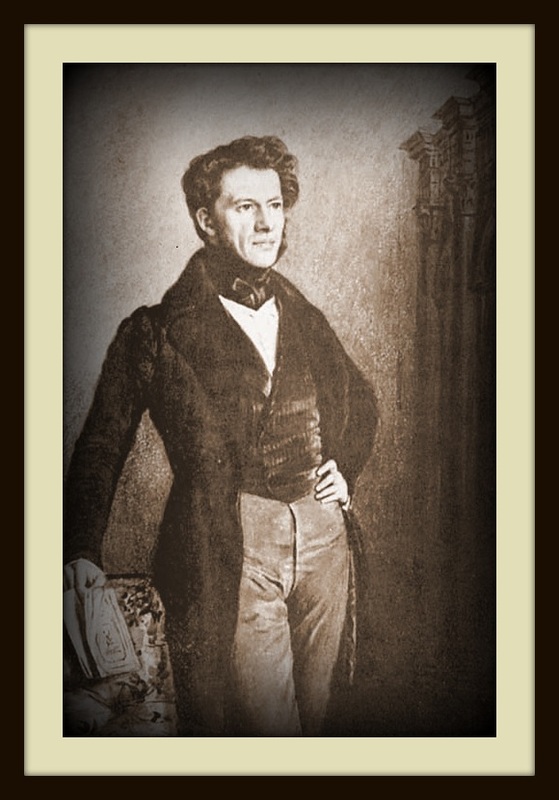 Charles Joseph La Trobe, an early traveler on the Coffee Road, wrote about his experiences in 1835. “…we were well aware that there was some sore travelling in advance. The roads through the south of Georgia are in the roughest state. The public vehicle which, as it happened, we had all to ourselves, rattled however over the country, when practicable, at the heels of a pair of stout young horses, from stage to stage, with a good-will and rapidity, which would have been very satisfactory, had the impediments in the roads and in the state of the crazy carriage permitted constant advance; but we only reached Milledgeville, the capital of Georgia, after three days and nights of incessant travel and that after a goodly proportion of breakdowns and stickfasts, besides having to wade many deep creeks and swim one or two. The streams were all flooded and ferries and bridges were seldom seen and I would rather take my chance for swim than pass over the rocking and fearful erection they call a bridge which under that name span many of the deep rivers on the road nearer the coast, and however rotten, are seldom repaired till some fatal accident renders the repair imperative. Yet the coolness with which the coachman, after halting for a moment on the edge of the steep broken declivity, and craning forward to look at the stream in advance, broad, muddy, and rapid, running like a mill-race, will then plunge into it with his horses, descending down till the water covers their backs, is admirable. On these occasions we always thought that a preparation to swim was no sign of cowardice, and made our precautions accordingly. From all this you may gather that travelling in the South is still in its infancy, and I may add shamefully expensive. You pay exorbitantly for the meanest fare. Prior to the opening of the Coffee Road in 1823, there were very few pioneer families in all of Irwin County ( then encompassing present day Lowndes, Thomas, Worth, Berrien, Cook, Brooks, Coffee Lanier, Tift, Turner, Ben Hill, Colquitt, and parts of Echols and Atkinson counties). Folks Huxford dated the earliest settlement of present day Brooks County. originally part of Lowndes, as occurring in 1823 after the Coffee Road was opened. “The influx of settlers was so great that within two years after the Coffee Road was opened up there had moved in approximately two hundred families, so that the southern half of the county [of Irwin] was cut off and made into the new County of Lowndes. Mapquest Route connecting remaining sections of Coffee Road. But the military road constructed by John Coffee and Thomas Swain in 1823 became the first route opening up the south central Georgia to pioneer settlers (see Daniel McCranie). Coffee’s road, as it was soon known, passed through the site of present day Nashville, GA and on southward to the Florida line, approaching only about seven miles west of the point where Levi J. Knight first settled on Beaver Dam Creek, the site of present day Ray City, GA.
John Coffee, builder of Coffee Road, earliest vehicular and postal route of this section. The Act to authorize construction of the road was passed in December of 1822. To alter and amend the eighth section of an act, entitled an act to amend the road laws of this state, passed the nineteenth day of December, eighteen hundred and eighteen. Be it enacted by the Senate and House of Representatives of the State of Georgia in General Assembly met, and it is hereby enacted by the authority of the same, That from and after the passing of this act, all overseers of roads appointed in pursuance of the before recited act, shall cause their respective roads to be cleared twenty feet wide, except market roads, which shall be cleared thirty feet wide, and shall cause all causeways to be made sixteen feet wide. Any thing contained in the said section of the said act to the contrary notwithstanding. Be it enacted by the Senate and House of Representatives of the State of Georgia in General Assembly met, and it is hereby enacted by the authority of the same, That from and immediately after the passage of this act his excellency the Governor be, and he is hereby authorised to appoint two fit and proper persons to superintend the opening of a road to commence on the Alapaha at or near Cunningham’s ford on said river, passing through districts number ten, twelve and thirteen in the county of Irwin, and number eighteen and twenty-three in the county of Early, pursuing the best and most practicable route until it intersects the Florida line near the Oclockney river. Sec. 2. And be it further enacted by the authority aforesaid, That the sum of fifteen hundred dollars be, and the same is hereby appropriated to carry the above recited section into effect. Assented to December 23, 1822. . 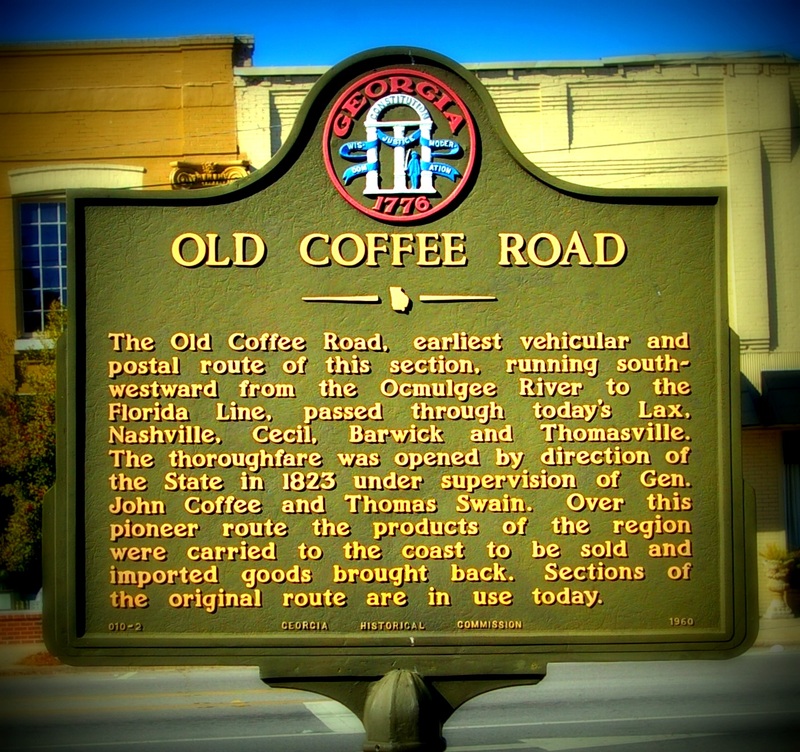 The Old Coffee Road, earliest vehicular and postal route of this section, running southwestward from the Ocmulgee River to the Florida Line, passed through today’s Lax, Nashville, Cecil, Barwick and Thomasville. The thoroughfare was opened by direction of the State in 1823 under supervision of Gen. John Coffee and Thomas Swain. Over this pioneer route the products of the region were carried to the coast to be sold and imported goods brought back. Sections of the original route are in use today. John Coffee, Indian fighter, planter and congressman, was born in the State of Virginia, in 1780, and when a small boy his father moved with his family to Hancock County, Georgia. He was not associated with General Jackson in his campaigns, as was his cousin and namesake of Tennessee, but later on he became a personal friend of that distinguished man. His military services appear to have been rendered to the State of Georgia in connection mainly with the Indian troubles of the first twenty-five years of the nineteenth century. In his youth he moved from Hancock County to Telfair County. 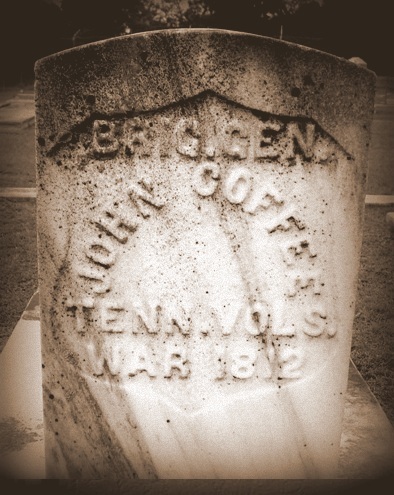 Most of his military service was rendered in South Georgia and Florida, and as it was a wilderness country, he is said to have cut out and built a road for the transport of his munition and supplies, which for half a century was known as the “Old Coffee Road,” and a part of it is recognized on the records of the state as the boundary line of Berrien and Coffee counties. The latter county was organized and named in honor of General Coffee by the Georgia Legislature in 1854. He served his county for several terms in the State Legislature, and this, combined with his military record, brought him into prominence as one of the leading men of the state, so that in 1832 he was elected to the Twenty-third Congress. In 1834 he was re-elected to the Twenty-fourth Congress, and was a useful, though not a showy member of Congress, but from the time of his entry into the House his health was infirm and steadily grew worse, so that on September 25, 1836, he died at his home four miles southeast of Jacksonville, and was buried there. COFFEE, John, a Representative from Georgia; born in Prince Edward County, Va., December 3, 1782; moved with his father to a plantation near Powelton, Hancock County, Ga., in 1800; settled in Telfair County in 1807 and engaged in agricultural pursuits; general of the State militia during the Creek War; cut a road through the State of Georgia (called Coffee Road) to carry munitions of war to Florida Territory to fight the Indians; member of the State senate 1819-1827; elected as a Jacksonian to the Twenty-third and Twenty-fourth Congresses and served from March 4, 1833, until his death; was reelected to the Twenty-fifth Congress on October 3, 1836, announcement of his death not having been received; died on his plantation near Jacksonville, Telfair County, Ga., on September 25, 1836; interment on his plantation near Jacksonville, Ga.; reinterment in McRae Cemetery, McRae, Ga., in 1921.